Throughout the years, I’ve developed quite the eccentric book collection. From biographies to poem collections to random “For Dummies” books, I’ve packed them and moved them as many as five different times. One part of me wants to own hundreds of books and have an in-house library of all the books I have (and mostly probably haven’t) read. The other part of me wants to rely solely on the library except for a small handful of meaningful texts that I like to revisit frequently. Given my current circumstances of the impending move, I’m going with the second part of me for now. And I’ll probably stick with it – the library has become one of my favorite places. It’s like shopping, minus the spending and permanent keeping of the things you bring home. Over the past year and a half, I am happy to say that my book collection has shrunk immensely. I’ve started to come to terms with the books I haven’t (and will never) read, and am slowly making my way through books I’ve been meaning to dive into. But still, books won’t fit in our car when we move – and they’re going to be expensive to ship. Free books at the library vs. paying to ship books I may or may not read. You do the math. Don’t say I didn’t warn you – it’s pretty random. So how am I going to part with some of these lovely books? I’m not nearly as connected to clothes as I am to books, so some of these are terribly difficult. But, as there is with everything, creating and applying a few logical rules is helping me figure out what should truly stay. Is it useful? Of course, this rule comes into play in everything I do. Is this book truly a useful addition to my life? Or is it a tiny bit of fat that can easily be trimmed out? Yea, as you can see, I’ve got some of those. Away with them! Have I read it? Or, better yet, will I? Here’s where the brutal honesty has to come in. Seriously, will I read that 12 Poets book? Actually, that one falls into another category, so I’ll explain why I’m keeping it…but Investing For Dummies? I picked that up on a whim and don’t think I’ll be using it anytime soon. Also, it might be from the 90’s so I’m not sure if it’s even up to date. Hello, Internet. Is it a reference or do you go back to it over and over again? I kept England, England because I loved it when I read it. It’s a whole mess of drama, but has some really great characters and complexities. I just finished re-reading it and can now send it off for another person to enjoy. So, will I read the others again? Cookbooks are hard because, you know, internet. I can look up anything in a couple seconds so I’m still deciding on those (they were wedding presents so that makes it even harder). Letters to a Young Poet will forever and always be on my shelves, no excuses. I will pack it in my car. I love it and recommend it highly to everyone. Is it beautiful or does it have sentimental value? Essentially, does having it make you feel warm and fuzzy? I know this can easily be made into a reason to keep everything down to toenail clippings, but I think you know what I mean. Are you making excuses for keeping it, or is it a real treasure? The Bible I got for my First Communion stays, as does the 12 Poets book I scored for pennies at a book sale with my husband in Traverse City on vacation. Strong memories help make the book more special and, yes, invaluable. These are the rules that are working for me – thanks to this thinking, I’m getting rid of half my books. The other half stays at least until December when I’ll go through them again with this same line of thinking. A little more than two months until we move, so pressure’s on. I am very fortunate, however, to have family here in Indiana willing to store a little of our stuff while we’re off on our adventures. Key word: little. Some people have a very different relationship with books than I do! How do you feel about them in your life? Are they important and irreplaceable possessions, or are you a library die-hard with only a few permanent books on your shelves? 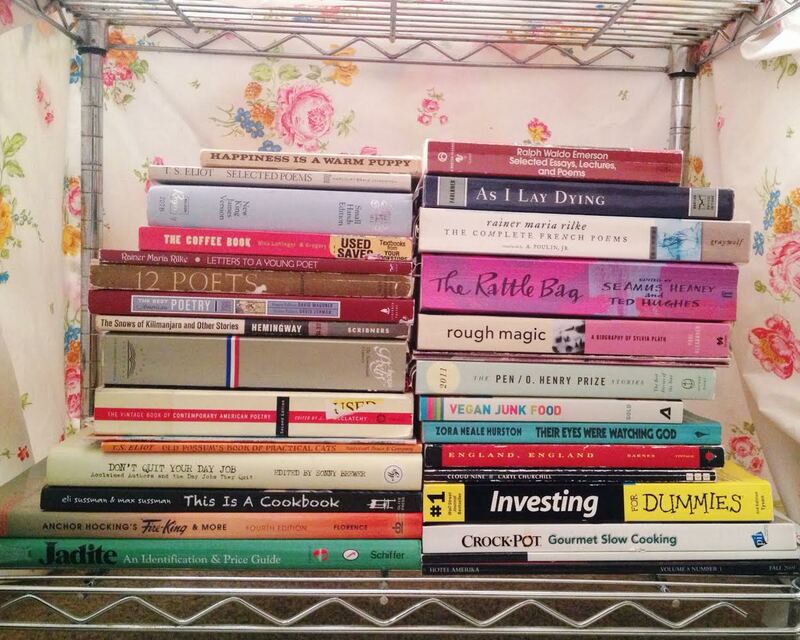 This entry was posted in Home and tagged books, declutter, get rid of stuff, minimalism, moving, simplify. Bookmark the permalink. I’ve just recently trimmed our collection down to size again. My husband and I have about 35 books between us, the kids can keep as many as they want in their rooms. They used to be treasured possessions and we had hundreds – most very rarely dipped in to. We pared them down to 100 a year or so ago, and de stashed again last month. I’ve removed all of my emotional attachments to them, my desire to be seen as intelligent and all the other ideas they embodied. It is very freeing. It is very freeing! Love that the kids can keep as many as they want, though 🙂 Books, if used properly (as in, actually read, as I am guilty of not reading so many) are some of the best possessions you can have. But not having to lug them around – that’s even better! Books are so dicey for people to see themselves getting rid of so well done making the hard choices. That was me a few years ago, I had something like three hundred plus weighty tomes and a room filled with bookshelves and loved them all…then I had to move across the country. After moving box after box that weighed as much as a box of bricks I said to myself “never again” and sold or donated about 75% of my collection. It was a great move. Now the only ones I have around are the near and dear to my heart and they were getting lost in the collection of a hundred ratty paperbacks. Thanks for dropping by James, love your blog as well!